Please enter Ishiba Ryokan and proceed inside. You will find a large wall clock. 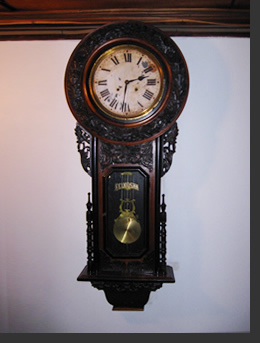 It is a slender wall clock tastefully lustered with Japanese traditional varnish. It is the witness of this story. It is an ordinary wall clock. However, may I jokingly call it "Daughter of Time"? Let's turn back the hand of "Daughter of Time" by 3,066,600 hours. It was 35 years ago. 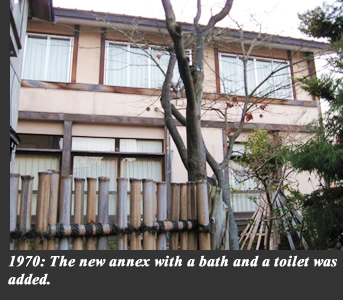 Now, I am writing this story, who was given the first bath as a newborn baby 35 years ago at Ishiba Ryokan. The period of 35 years is long enough for a baby to reach full manhood and for a man of middle age to reach the golden age. I feel some difference between the time ticked down by "Daughter of Time" 35 years ago and the time still ticked down at this moment. 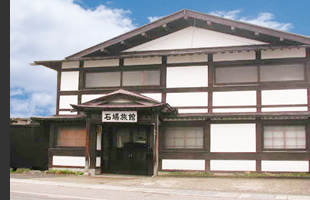 With the use of the Internet technology, you are connected online with the small ryokan located close to the northern end of Honshu. We are living in an age when we can instantaneously share a numerous amount of information. "Daughter of Time" should not have known the coming of this age, nor did anybody including you. It must be a fortunate fate that Ishiba Ryokan is linked with you on this occasion. There is no special story to tell about the history of Ishiba Ryokan of Hirosaki except for its steady history. However, let me guide you through the "Travel of Time". Let's assume that the hands of "Daughter of Time" were telling the time 35 years ago. First, let's look at Hirosaki and Ishiba Ryokan when I was born. 35 years ago --- Ishiba Ryokan was managed by my mother or the current landlady. She was born during the turbulent times of the World War II and grew up during the post-war restoration and the era of economic growth of Japan. It was the time when large-scale department stores and hotels began to be built and the roads were constructed in the Tsugaru District. While the landscapes of Japan made drastic changes throughout the country, Hirosaki has still keeping old historical townscape like old geological stratum. In those days, Ishiba ryokan was already old bones since the foundation that caused us to respond to constantly changing lifestyles and values of Japanese people so as to provide safe and comfortable services to our customers including new constructions and restructuring such as reforming some of the rooms for single occupancy, new construction of rooms with a bat and a toilet, reconstruction of the front part of the building, and creation of new menus of meal while keeping the old buildings. "Daughter of Time" was watching us and our customers quietly at the same place as ever. When I was beginning to understand things, the landlady was pressed with business. Therefore, I remember that I used to spend more time with the mother of the landlady or the grand landlady, my grandmother. The grand landlady was born at the end of Meiji Era under the remaining excitement of the Russo-Japanese War. Enjoying her youth in the bright modern era of Taisho, she also experienced the dark age of social situations during the World War II. After the war, she used to be surprised by the hustling but wonderful economic growth of Japan and remonstrate against the times occasionally. When we are busy or changes are rapidly occurring around us, we tend to be embarrassed with the feeling that time flies like an arrow. Possibly, it was this era that Japan as a whole was in such situations. The steady ticking tone of our "Daughter of Time" gave Ishiba Ryokan an unshaken order and permitted us a bird's eye view of the times. Let's turn back the hands of "Daughter of Time" by 271,560 hours. It is one page in the history of Ishiba Ryokan about 66 years ago. The main fleet of the Japanese Navy suffered a crushing defeat at Midway this year. Under the aggravation of the war situations, the grand landlady, still young at that time, was pregnant. Under the unstable environment of social situations, there was a heavy traffic of people and goods in Hirosaki. It was because Hirosaki was developing as a "military town" of the 4th Division of the Japanese Army that is well-known for the accident in snowy Hakkouda Mountains. As a symbol of such development, a department store with an elevator was built in the town. Western-style buildings and women in western clothing increased, and the streets were prosperous. Presumably, Ishiba Ryokan also enjoyed the prosperity. During the war, Ishiba Ryokan was designated as "Purveyor Ryokan for Army Recruiting". Many army-related persons and their family members stayed at Ishiba Ryokan. The guest register remaining at Ishiba Ryokan has recorded the active situations of those days. After the defeat of Japan, Ishiba Ryokan was requisitioned as facilities for the Allied Occupation Forces. In the midst of the state of confusion, the grand landlady gave birth to a baby girl, the current landlady. As if in the replacement of the birth of the newborn life, the mother-in-law of the grand landlady or the grand-grand landlady breathed her last breath in the same month. There were soldiers going to war, stay of the Allied Occupation Forces, people returning from war and people of no return. During the days of heavy ins and outs of people, "Daughter of Time" should have quietly watched encounters and partings of people. "Daughter of Time" continued steadily to tick the time. Let's turn back the hand of "Daughter of Time" further from 66 years ago. The hands of "Daughter of Time" stopped at the time of 129 years ago in Ishiba Ryokan. To tell the truth, "Daughter of Time" did not exist yet at Ishiba Ryokan, Hirosaki in those days. The manufacturer of "Daughter of Time" did not exist in this world yet at that time. Without a witness turning back the time, no one can tell a story. 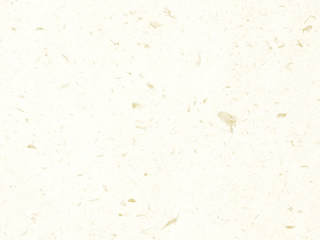 The story, however, can consist of fragmentary memory of old days. The story that I know and I can tell consists of what I have heard form the current landlady and the grand landlady. Furthermore, the grand landlady heard the story from the grand-grand landlady mentioned above. In fact, the grand-grand landlady was the wife of the founder of Ishiba Ryokan of Hirosaki. The founder of Ishiba Ryokan was possibly a samurai of low rank in Tsugaru Clan. After banning the wearing of the sword at the beginning of Meiji era, he started a peddling business with small goods packed in furoshiki. He was reportedly a "very assiduous" person. He should have peddled along the streets of Hirosaki, spreading his furoshiki and shouting "How about a beautiful hairpin from Kyoto?" and what not. Eventually, saving some money, he opened an inn with a shop for daily goods. It was the inception of Ishiba Ryokan. It was 26years after Commodore Perry anchored at Uraga. It was the 12th year of Meiji. It was a transitional age when the constitution was still to come that the founder started the business probably through a trial and error process. The founder, ex-samurai, passed away one year prior to the demise of Emperor Meiji. With the debacle of social orders under the Shogunate system, a newly civilized Japan was restored out of chaotic situations. Ishiba Ryokan in the castle town took a form, dreaming the same dream together with the country. The hands of "Daughter of Time" continue to turn round. 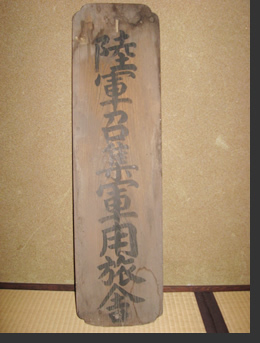 Did "Daughter of Time" that made a debut at Ishiba Ryokan as a symbol of the new civilization see the death of the founder, ex-samurai? Nobody knows. It only continues to tick down. Look! The scene has turned from the one where the founder used to work awkwardly on soroban to the one where I am hurriedly working on a personal computer. It seems that "Daughter of Time" moved forward the hands to the present day. We collected and looked at the past history of bits and bats. How did you enjoy the "Travel of Time" of Ishiba Ryokan of Hirosaki? Do you want to move forward the hands of "Daughter of Time" to the future? Unfortunately, that's impossible. It is you watching this Website that will create the future of this story. We are sincerely waiting for meeting with you. Well, "Daughter of Time" seems to be out of shape. It is some time since she stopped ringing a bell. I would like to give her some time to rest.